This is known locally as the “town” side of Oahu. 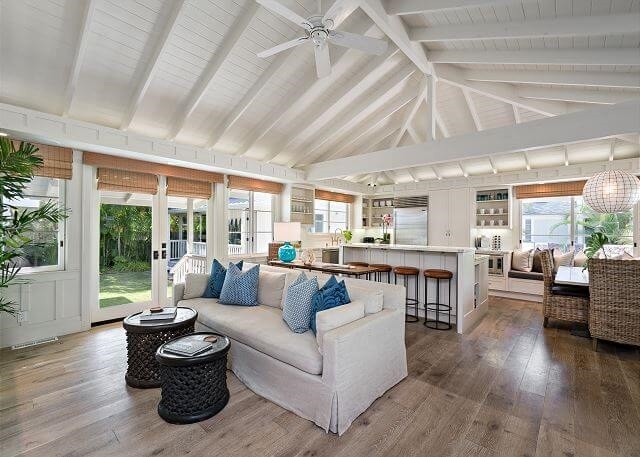 Selecting a house on this side of the island is a good idea if you want to have the option of going to the beach but also being close the attractions of a more tropical urban environment. Here you have the advantage of being close to Waikiki, downtown Honolulu, Chinatown, the University, the Honolulu Zoo, Honolulu’s many museums, Iolani Palace, Ala Moana Shopping Center and the many fantastic restaurants Honolulu has to offer. There are also a number of natural attractions on this side of the island such as Manoa Falls and Hanauma Bay. 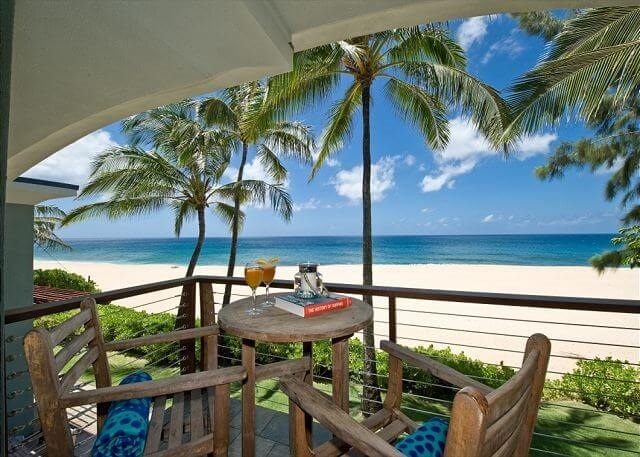 Our Oahu Hawaii Beachfront Rentals offer you the opportunity to enjoy a beachfront Hawaiian vacation but have the convenience of being close to the major tourist attractions located on this side of the island. About 10 minutes from most of our homes on the South Shore this is an attraction you don’t want to miss. The bay is what is left of a collapsed volcano located at the edge of the water. The waters in the bay have been designated a marine preserve. You will swim alongside hundreds of local fish and other marine life. For those of you who like to shop, the South Shore has a variety of options. The world-famous outdoor mall Ala Moana Shopping Center is located adjacent to Waikiki. It has all the high-end stores you would find in any metropolitan area and a vast selection of local options also. Close to our homes located on the South Shore is Kahala Mall. It has a selection of shops and also a movie theater. Honolulu has also had a recent upsurge in local boutiques. 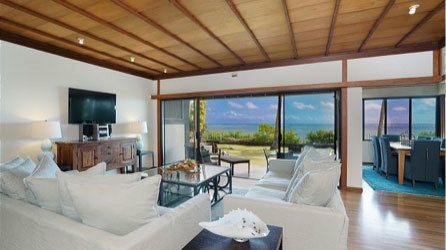 If you are looking for unique items to bring home for your vacation you might try visiting them to find urban Aloha style options. A list of those you might want to look at visiting can be found in our downloadable Visitor’s Guide. To check local listing time visit this site. MOVIE THEATERS. Theaters closest to our south shore homes are the Koko Marina Shopping Center or Kahala Mall. The Ward 13 Theater is just past Waikiki and about 20 to 30 minutes from any of the South Shore homes. While the drive is a bit further, the Ward Theater does have full recline seating for those looking for the most relaxing movie experience. For those of you who don’t want to get wet but want to see what is under all the water that surrounds our islands, this is a safe and educational tour where you can learn about Hawaii’s underwater ecosystem. The submarines in this fleet have been featured in National Geographic and Newsweek. A sure hit for children and adults alike, this oceanfront facility should be on your list of things to do. The park features interactive exhibits with marine life and shows which feature leaping and dancing dolphins and seals all with the backdrop of the ocean. As an added bonus, the drive to Sea Life Park is along the islands southernmost tip and has a number of scenic spots to stop and take a look at some of the more scenic coastal views on the island. Order a private viewing with Oahu’s tropical bird specialist. He will come to your home with a selection of tropical birds for you to have your photo take with. Visit his site at birdguyhawaii.com. Take a trip into Hawaii’s past with a visit to the Bishop Museum. The Museum houses and showcases 13.5 million insect specimens, 6 million marine and land shells, 490,000 plant species and 500,000 marine invertebrates in addition to its extensive collection of Hawaiiana. A recent addition is the Science Adventure Center which takes visitors inside volcanoes and provides a hands-on learning experience regarding islands and their formation. Open daily from 9 a.m. to 5 p.m. Here you will get a good overview of the history of Hawaii! This museum has a wonderful selection of artwork and the lawns and the outdoor statues with the views of the city behind them make it a worthwhile trip alone. Also, visit the Contemporary Cafe while you are there for lunch. The buildings themselves are worth seeing and there is a good selection of artwork from around the Pacific and frequently a good traveling show. There is also a wonderful cafe for lunch here and a nice gift shop with unusual items great for gifts to take home to remember your time in Hawaii. Step into the 19th-century original home of a missionary and get a view of the past. Visit the only home of Royalty in the United States. Iolani Palace was the home of Hawaii’s ruling monarchy. Make sure to book a guided tour as the knowledgeable docents will weave a moving tale that will illuminate the special and unique place that Hawaiian history holds in history. A delicious blend of Hawaii’s unique cultures and flavor. Hawaiian Fusion. Eat at the outdoor patio overlooking the ocean in Hawaii Kai. The sunsets are fantastic from this location in the Hawaii Kai Towne Center. (808) 396-7697. A charming street-side cafe in Kaimuki. A local favorite for its fresh often locally grown organic menu. Classic Greek with freshly baked pitas and wonderful falafel. Located just next to Kahala Shopping Center. Wonderful Italian on the water in Koko Marina Shopping Center. Offering large or smaller portions, their garlic fish salad is divine. Give them a call at (808) 396-0756 to reserve your table! Instead of the standard Starbucks coffee, try a bubble drink. Coffee or Tea is located on Kapiolani Avenue in the McCully Shopping Center and has some of the best original Chinese bubble drinks on the island. Try the jasmine tea bubble drink or milk tea which are two of the basic drinks. Costco – Located at 333A Keahole St Honolulu, HI 96825. Safeway – Located in Hawaii Kai on Keahole Street. Located in Kahala Mall at 4211 Wai’ale Avenue. The 24-Hour fitness club is located in the Koko Marina Shopping Center and offers day passes. There are a number of places. A close Bikram class can be found at Hawaii Kai Bikram Yoga located on the second floor of the Koko Marina Shopping Center. Call (808) 396-8838 for the schedule of classes and rates. Yoga Hawaii is a great place located in Kaimuki and has a variety of classes in group or private instruction in Hatha yoga classes from Ashtanga to Kripalu. Both studios are close to the homes located on the South Shore. A final option is Sun Yoga which is located just near the Foodland supermarket in the Aina Haina Shopping Center. Lots of options. We love our yoga in Hawaii! Request our Complimentary Travel Guide!